Managers of pediatric doctor offices should pay as much attention to their pediatric waiting room furniture as they do to the manner in which clinical areas are outfitted. Standard lobby chairs do little to make children feel comfortable and confident. You watch children who are waiting in most likely notice that they are fidgety and climbing up and down, and in and out of standard adult size waiting room furniture. One goal of furnishing a pediatric office appropriately is to make kids feel comfortable. The first step towards this goal is to make sure that kids have seating that is sized for them. Next, consider color; bright primary colors are familiar to little ones. As familiarity helps make children feel less stressed it is a good idea to explore our children's waiting room furniture section to see the latest trends in brightly colored pediatric waiting room furniture. When designing your pediatric waiting area remember that adults will need lobby chairs too. Browse through our regular waiting room furniture to select adult seating that integrates well with your pediatric waiting area furniture. 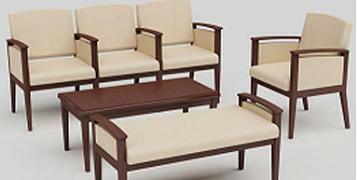 Contact us today for any questions or to place your order for your new lobby furniture.